← Happy *belated* Birthday Apple4today!! Penang has the BEST FOOD!!! Best Ice Kacang with Fruits – Swatow Lane. That would be the stall outside, not inside the coffeeshop. No denying that’s the best already!! Since you are there, might as well try the glutinous rice/Bak Chang!! I always love to eat that as well!! It’s also located around swatow lane, to be specific, Nagore Road. The egg tarts are always sold out, once i went several times in 3 days just to get some. It’s so so yummy and cheap. At RM2.20 per bowl, y0u can have like so many bowls ok, and also the crispy spring rolls are a MUST!! Dip it with your laksa soup, it taking the fast lane to heaven. Alternatively, you can try the one at AirItam but personally i dont like it at all!! But alot of KL ppl like to eat that la..dono why also..
At night, along Chulia Street. This one, go for the experience standing by the roadside drinking coconut under the hot sun lor. HEhehe..it’s a good experience and also add some *ohm* to your trip to penang right? Plus, the coconut juice is good for you, so why not? and it’s cheap ok!! At night, it’s macallister road, opposite Agora Hotel. It’s the corner shop. very brightly light. THIS is the mother of all chee cheong fun!! The sauce its godlike! The secret? Because they add some peanut butter into it. People like tarpau this over to indonesia and so on want ok…so come must try. Kuching has its Kolo Mee, Penang got it’s Tok Tok Mee. Cheap, good and big portion!! But the wait is kinda long la..and the stupid fella kinda forgetful, it’s a twin so sometimes i also forgot i order from which brother, or go scold the wrong person for having to wait so long..HEehehe There’s another stall along Terengganu Road which is behind Frees School, but i dont like there one cos the boss very lansi. Lansi places i dont like geh. Best Koey Chiap – Bee Hooi Coffee Shop, afternoon. 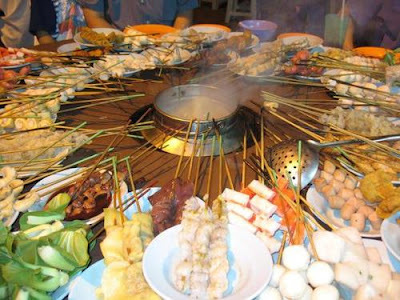 Whats the best thing bout eating lok lok in penang?? The price!!! The most expensive stick is only at RM1+ KL ones are like super duper expensive. Can broke one. The record breaking is held by my Cheras friends, 4 guys – nearly 100 sticks. Scary huh..cos it’s cheap so they pok meng eat. It’s a small minivan that managed by old uncle and auntie. Very very nice lor the burger, mouth watering. Everytime, even when i’m like super full, i still wanna buy if i go around that area. It’s infront of Ingolf area. Everynight, you can see alot of cars lining up by the roadside just to buy this burger. and all those cars are like bmw, or merc cos rich people stay that area. This one, you must go early to beat those lunch time crowd. Or else the boss will tell you ‘boh liau” finish ady, so normally i will proceed to eat mcd. very sad. And then if you go there, there’s only 1 type of drinks. No other choices wan. Best Duck Rice – Opp. Tanjung Bungah bus station, around lunch time finish ady. or Happy Coffee Shop, in Lipsin garden opposite Macro. I hate duck rice and that’s the only 2 places i will eat duck rice. It’s that good i tell you. There’s another one that opens only at 3am, but till today i dono where is it. Can someone tell me ar? thanks. So Young cafe, next to Lam Wah Ee hospital in Greenlane. Opposite the police station, normally very full at night after clubbing time. Another one i like to go is Ali, along penang road where got 1 famous Transex used to work name Siti. Heehehe..”she” likes to flirt with the guys and i was very entertain by her antics. 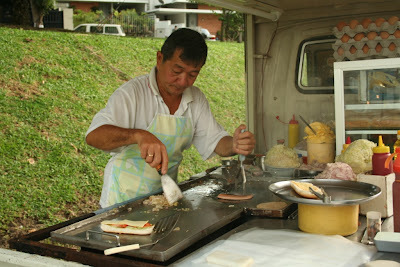 They have very nice Roti Hong Kong – THAT KL TAKDA!!!! They have like the freshest steam fish ever, and extremely crispy popiah to go with. Their specialty is little chicken. It’s actually spring chicken la, so dont worry, we are not eating chicken little. The lil chicks are extremely popular and always sold out. They also serve octopus and wild boars meat. To alco lovers, you can try their tuak here. Very fresh. Some people canot take the smell, but i like. It’s indian alcohol and made of coconut. infact i think it’s something like lassi. Best Char Koey Teow – Macalister Road, sister charkoeyteow. Surprisingly i dont eat charkoeyteow, but these are the one that people are crazy about in penang la. Also, the super lansi and expensive one, Lorong Selamat. 1 plate can cost you RM5 and above, what move when you need to line up and get it yourself. ughh..i dont like. Best Hokkien Mee– Lebuh Macallum, dinner. This is where we call “3rd street” in penang. They have alot of nice food there including the fried oyster. This one they had a stall suddenly out of no where, but people still line up to eat. No place to sit and no table to eat, so eat where? The hokkien mee is so nice that people will squat next to the toto shop just to eat this delicious stuff. Selling is a very cute aunty with a super high pitch voice. Canot miss wan, cos very noticeable. although she’s like super short. hAHA..sorry. Ok, alot of people say the other place is nicer, but to me, this is the best place already. You eat on a beach, can see sunset if you go earlier. Estimate bout RM200 for 10 adults for about 8 dishes, the type you eat till gila and still canot finish type. The thing in the photo is “chi ley” spikey shell type. Just showing you people cos i know alot of people haven’t seen it before. My friend somemore collect the shell to give it to his gf as souveniour. Super sesat one. There’s a small stall selling just satay next to the seafood place. Although the satay is 60cent per stick, it’s super nice. so try la. If you have the time, can go YEN at batu kawan. Its really nice also, must try the fried mantau. This one i always go with my family on sunday mornings and also with my grandaddy every morning when he drop me off to school. Its so best that normally have to wait for a table like mad. Advice, drop some people to wait for table while you go find parking, cos it’s super hard to find a spot in penang old town too. Best place for chinese food when you are sick of mamak after clubbing – Green House, Burmah Road. I think its the few that opens till 5am and has a lot of varieties. Try the “yue sang kai chok” /porridge. It’s good. Perak Road – Economy Rice during midnight. Famous for “Or Bak” which is dark soy sauce pork. Best Loh Mee – the coffee shop next to adventist Church, opposite union primary school along burmah road. Only Afternoon. Best Economy Rice – Perak Road. The area where alot of motors and scary people stays. HAHAha..teongli dont kill me. Yet, they have the best and cheapest economy rice. The tau eew bak, is very best!! Best Bak Chang – Swatow Lane, and The van beside adventist church along burmah road. It’s also afternoon only. Best Soyabean – Island Glades, there’s a shop selling only soyabean. Very famous. At night, would be the one at Terengganu Road infront of Eden. It’s a very cooling to eat when you got nothing to do in the hot afternoon. Consists of jellies, a slice of lemon, shaved ice and also lychee. Good for heaty body also =) The stall is just opposite the one selling the goreng pisang. Can’t be missed. 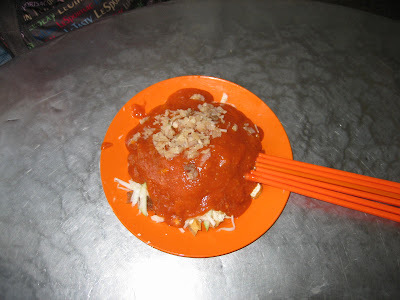 Best Indian Mee Goreng – Mount Eskine afternoon, damn good, fried by chinese guy somemore. Although the name is roti babi, but it’s NO PORK! ok? I also don’t know the reason it’s called roti babi, but its actually spring rolls with some meat. The most important ingredient to the whole thing is that you must eat it HOT and with the black sauce which i highly suspect it’s HP sauce. 23 Responses to Penang has the BEST FOOD!!! the title already shows how everyone’s perceptions of penangites, pls go out and see more penangites, just pay that toll fees, I know it maybe kind of expensive for kiam siap penangites. Best or jian(Egg Fried Oyster)…around Jetty. Wah… I just hantam alot in Penang last week. Anyway… Asam Laksa opposite Peng Hwa still got ah? Long time never go there liao… but I prefer Balik Pulau 1. Best! Love the pics. These regular roadside stuffs are the food Penangites living oustation or overseas and others who’ve tried it before crave for and miss. YOu should try it before you comment. I would agree that KL’s Wan Tan Mee’s tastier though. Kenny: si yang yang, i eat since im small maybe tat’s y i bo rasa haha. 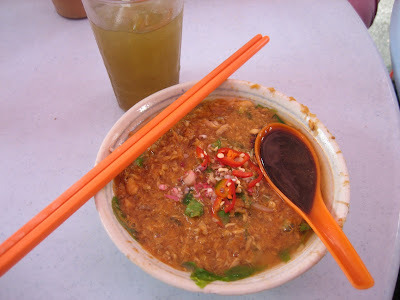 I love Penghwa laksa lor..
Jason: thanks =) i think the wantanmee is nicer in kl too..
u made me soooo hungry!!! and its 6am in the morning!! Best Balitong from .. errr which bridge was that ar?? cant rmemeber..
u juz made regret deciding not to come back home. wark! wish to share with u some of my favourites too.. maybe u can give them a try next time? Lok lok- a small stall selling at nite in front of the coffeeshop near Jetty.. it’s very nice and cheap, with the most expensive stick at 60 cents. Muar Chee- the one outside Genting coffeeshop is good! wow! the picture of THAT ice kachang …! Must visit Penang soon ! dun understand wat is wrong w penangites being proud of penang food. why penangites have to withstand so much criticism for being ‘penang’? dun u miss ur hometown too? hi what is your opinion on the best hokkien char? gallivanter: It surely had drop, but i feel it’s still better than some other places. But not all lar..
jessy: Thanks! I love the otak-otak and muar chee too!! The otak otak same stall with bak chang, no? the 6ix cent: I’m from penang, and staying here, so i dont actually miss it. And of course we are proud of our local food. Aren’t you proud of ur singapore food huh? annonymous: Hokkien Char, penang terms or kl terms? cos it’s 2 different thing..hehe..
Well, i’m a pure KL fella but went 2 malacca for my degree course at MMU. I kinda like ur blog but i think its better if it can be listed in categories of morning, afternoon, and nite or even rate it from da best 2 da worst in ur list. I’ve been 2 penang several times, i still remember da ics kacang in Lorong Selamat used 2 be very very nice but den i think recent years back da standard really deteriorate like so badly, not 2 mention da price too. Living in Malacca for almost 3 years, i ‘d like 2 promote da Satay Celup in malacca. In penang, da lok lok is just by dipping it into boiled water, in Malacca, its dipped into satay sauce. If u have a chance 2 go malacca, go n find da stall at Jln Ong Kim Wee, its difficult 2 miss it since its a 2 shoplot coffeshop. Theres 1 called Capitol at Jalan Bunga Raya also but i prefer da 1 at Jln Ong Kim Wee coz its more spacious and cooling while eating this hot n spicy stuff. Well, been da 3rd year here at malacca, i still can’t finish listing all da nice food in malacca, hopefully i’ll get it done b4 i graduate. anonymous #1: Erm, i dont really fancy hokkien char lar, but you can try maccallum street in the afternoon. At night, carnavon street, the corner beside the fruit stall..between the temple..
Nicholas: Thanks for your suggestion, but i actually compiled the whole list in like a few hrs time during midnite when im super sleepy. Sorry for being messy in it. Anyway, all the food listed should be the best already right? Else it wouldn’t be in the list in the first place. I’ve tried Malacca delicacies before because i have friends in MMU as well. The most memorable food i had in Malacca would be the cockle shell and cuttle fish at the lorong near Ong Tai Kim at night. Simply the best! OMG!!! *clap clap clap* I love this review…with yr information, i think it will help me in my contest soon! wah.. just randomly click ur most popular post.. regret liao.. make me hungry..